Anyway the government believe that the average water rate will be no more than 240 euro per annum. The first 30,000 litres for every household will be free and a house with children under the age of 18 will get an additional 38,000 litres of water per child per year free. Still with me? It sure is confusing. As the water meters will not be all installed in Ireland until 2016 it looks like we are all paying a fixed charge for the next couple of years. There is some other announcement coming in August so really have we learned anything at all about the water charges over the last few days??? Anyway below I have outlined five water saving tips which will cost you nothing and five more which would involve some investment in water saving products. All these products should provide a quick return on investment. Quite how quick who knows as the water charge rate still has me as confused as hell for one! 1: Don’t let the tap run when brushing teeth. 2 Minutes brushing with tap running could waste about 20 litres of water. 2: If tap is running whilst you are waiting for hot water to flow. Use a bucket to collect the cold water and put it to some other use such as watering plants. 3: When we want to drink some tap water many of us have a tendancy to let it run for a while until it getter cooler. Instead of doing this always keep a supply of tap water in the fridge. 4: Ensure to only use dishwasher and washing machine for full loads. Dishwashers will use about 25 litres per cycle and washing machines about 50 litres per cycle. You will be saving on your energy bills as well of course. 5: About 30% of water used in the house is flushed down the toilet. In older toilets fill a plastic bottle full of water and place into the cistern. This will result in less water being flushed away every time you flush. Toilet cisterns installed since 2004 or so tend to be all 6 litre flushes but those before that are between 9 and 12 litres which is not really necessary. Better still as the old phrase goes “If its yellow let it mellow and if its brown flush it down. 1: Showers: Install a low flow or Aerated showerhead. 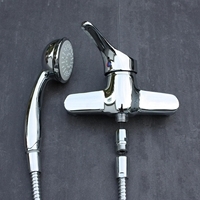 Aerated showerheads output a mixture of air and water so the pressure coming out of the shower is not compromised but you are using about half the water. Some showers have an output of up to 15 litres a minute so between the water charges and the energy required to produce the hot water in the first place significant saving can be achieved with these showerheads. If you don’t want to replace your showerhead you can also get Shower Flow Regulators which are attached to the faucet of the shower. 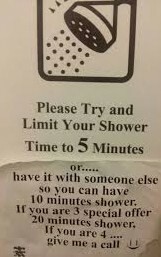 Also consider installing a Shower Timer in the shower just to reinforce the point that people should be spending 5 minutes instead of 20 minutes in the shower. 3: Install water butts which collect rainwater to the downpipes of your home. Even during a good summer in Ireland it is only to be empty too often. Your plants generally prefer rainwater to tap water anyway. 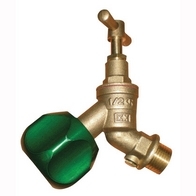 4: Install a tap lock on your outdoor tap to prevent theft or children just messing around and forgetting to turn it off. Our one does not require a padlock to be fitted to it. 5: Install an instant electric hot water tap in kitchen and possibly even bathroom taps. During the summer in particular there is little point in turning on heating system or 50 litre immersion tanks when you just need to wash a few dishes. If there is a long draw from immersion to sink it also prevents cold water from being wasted whilst waiting for hot water to flow through. Some good tips there. I like the outdoor tap lock. Some good figures on water bills too.